If you are planning for cupola for existing building, make sure that building structure is strong enough to hold the weight of cupola. If it is for new construction, then use extra trusses or rafters to mount the cupola. Determine the roof pitch before you start installing the cupola. 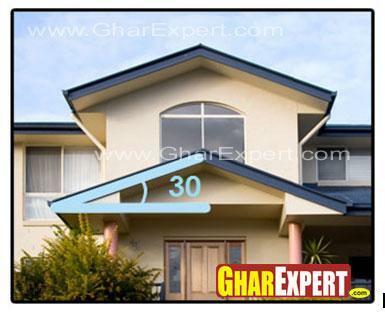 Roof pitch is the measurement of roof steepness. 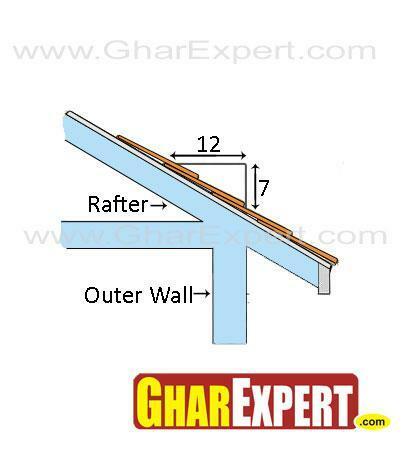 It is the measure the amount of rise your roof has compared to the horizontal measurement of the roof. If you have planned cupola for ventilation, then keep in mind the roof leakage. To prevent any leakage in cupola, you should cut the hold 6” smaller than the size of cupola. Pitch measures the rise your roof has as compared to the length. In the abpve figure, it is shown that for every 12 inches of length, how much your roof will rise? It is 7 inches. So, this roof has a 7 inch picth or slope. 10 things to check before the rain hit your home! Rain is fun but the fun may not last if your home fails to protect itself and its occupants from the elements. This write up lists 10 things you should check before the start of the rainy season. Do you want to increase your working efficiency and reduce energy cost too? Opt for daylighting which offers strong health and good working environment in addition to reduction in energy cost/bills up to 50 %. Let’s read this article to know more facts. Do you know unhygienic indoor air can create risks to our lives? It can cause asthma, allergic diseases and respiratory problems. This article lets you know several causes and remedial measures of indoor air quality. Proper ventilation freshens our breaths and leads us a healthy life. If you design or modify the house with maximum ventilation by installing proper windows and ventilators which gives more light and fresh air in the building. Take utmost care to avoid dust during day long activities else the dust causes asthmatic problems to your lungs. Smoke ruins not only our stamina but limits all options to live also. The selection of a site depends upon ones present and future spatial requirements, the envisaged available funds, one’s lifestyle. The whole building should be constructed at one time to avoid settlement in any portion of the building. Everyone wants to build a dream home but no-one wants the hassle that comes in day-to-day construction work. Here are the guidelines that can help you pick a good contractor and make sure the relationship stays smooth throughout the construction work. GharExpert.com would like to thank Rajni Jhabak, Amika Rai and Love Thy Community for their contribution to GharExpert database. The capacity of doing work by an artisan or skilled labour in the form of quantity of work per day is known as the task work or out turn of the labour. The out-turn of work per artisan varies to some extent according to the nature, size, height, situation, location, etc. In well organized work less labour is required. The following may be taken as the approximate quantity of work or out turn or task for an average artisan per day.